Apparently it’s not okay to be white. 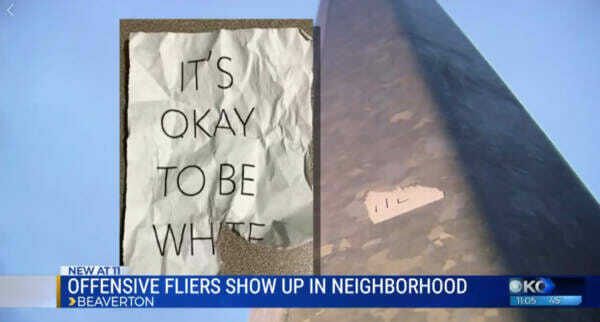 That’s according to Portland residents who are losing their minds over flyers that read “It’s Okay To Be White” were posted in their neighborhood. The guilty, rich, white Portland liberals are up in arms, referring to these as anti-Semitic and a sign of white supremacy. It isn’t a threat and it isn’t actively promoting violence but a flyer that’s been making the rounds in a Beaverton neighborhood has some people upset over it’s message. The flyers, which say “It’s OK to be white,” have popped up on power poles and street lights in the Sexton Mountain area. One neighbor told KOIN 6 News that part of town is a melting pot and she wants everyone to feel safe. Summer couldn’t believe she found the flyer just down the street from her front door. She said it upset her so much, she took it home and ran it through the shredder. Others in the neighborhood have spotted them too. “My neighbor, Naomi, she also crossed one today and sent me a picture of it,” Summer said. Earlier this month the Sacramento Bee reported identical flyers popping up around American River College and in Florida, the Anti-defamation League said a Target employee placed a card with the phrase in a box of diapers. Summer said there’s no place for that here and she wants her neighbors to know they’re more than welcome. Beaverton police said they did take a few phone calls about the flyers. People are even calling the police to make reports about the flyers. By opposing this message, are liberals saying that it’s not okay to be white? Have they lost their minds, or did they even have minds to begin with?